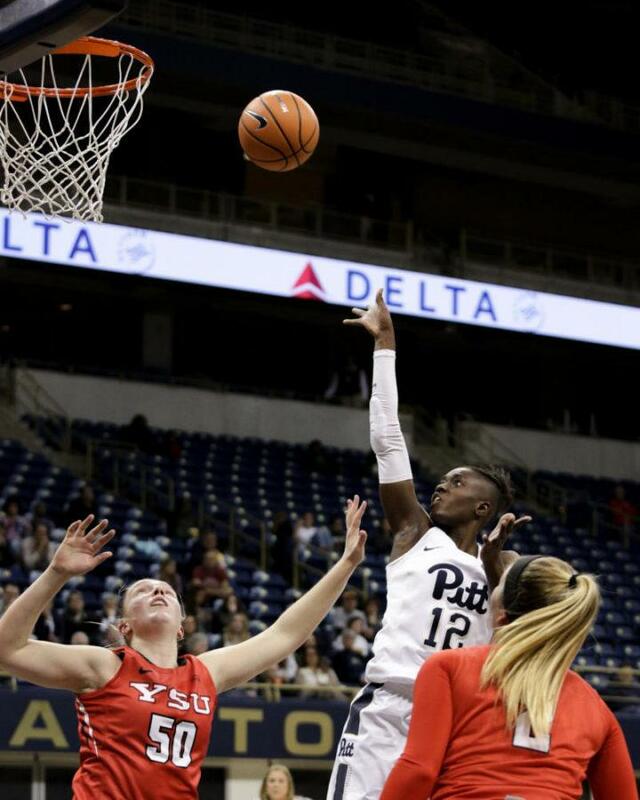 The Pitt women’s basketball team couldn’t capitalize on another strong performance from redshirt junior forward Yacine Diop, falling to the undefeated No. 2 Louisville Cardinals, 77-51 — despite Diop’s 26 points. The Panthers (9-10 overall, 1-5 ACC) had the game as close as seven at a point in the third quarter, but Pitt’s offensive struggles in the fourth quarter — shooting just 20 percent from the floor — lead to a Cardinal victory. Wednesday’s game was the first of two meetings between the Panthers and the Cardinals this season. Head coach Suzie McConnell-Serio will be looking for more offensive production in the next matchup. Pitt got out to an early 5-2 lead after a jumper by sophomore guard Jasmine Whitney and a 3-pointer from Diop, which led Louisville to call a timeout with 8:37 left in the first quarter. Although the Panthers started well, the Cardinals quickly went out on a 10-0 run to make it 12-5 with 4:50 remaining in the first. Louisville junior forward Sam Fuehring had a great first quarter scoring eight points on 3-for-3 shooting. After falling behind, the Panthers came back on a 9-2 run to end the quarter, cutting Louisville’s lead to four. Sophomore guard Alayna Gribble hit two 3-pointers during the run and was the leading scorer at the end of the first. The second quarter was all Diop — literally. She scored all 15 second quarter points for the Panthers, giving her a total of 19 at the end of half. She finished with 7-10 scoring in the half. Diop scored the first three buckets for the Panthers in the second quarter to help the Panthers stay in the game. Louisville sophomore guard Sydney Zambrotta hit two 3-pointers to keep the Cardinals in the lead 28-22 with 6:26 left in the second quarter. After Pitt took a timeout, Diop made two more shots and a three to score 13 points consecutively, before missing a shot with 3:47 to break the streak. Louisville started out third quarter with a 8-0 run thanks to two baskets from junior forward Myisha Hines-Allen, including a three point play to make the score 43-31 less than two minutes into the second half. Diop finally broke the Panthers’ scoring drought with 6:19 to go in the third quarter and then added another basket. Until junior center Kalista Walters scored with five minutes to go in the third, no player besides Diop had scored a point for Pitt since the first quarter. Diop picked up two fouls in the third quarter, giving her four, which limited her the rest for the way. Louisville led Pitt 53-43 heading into the fourth quarter. The Cardinals took initiative in the fourth, with first-year forward Bionca Dunham getting three baskets down low to start off the quarter. A bucket from Hines-Allen and two 3-pointers from first-year guard Dana Evans gave the Cardinals a 24-point lead and put the game out of reach. When head coach Suzie-McConnell Serio called a timeout with five minutes to go, the Panthers were down 71-43. Louisville also played brilliant defensively, not allowing Pitt to score a point until Gribble hit a 3-pointer with 3:17 to go, but at that point Pitt was already down 24 and the game was all but finished. The Louisville defense pestered Pitt’s best players all night, including Kalista Walters who was scoreless in the first half. Pitt will be back in action Sunday afternoon, January 21 against Syracuse in the Carrier Dome at 2 p.m.